Pro-Stage Queensland we pride ourselves on being some of the most professional staging hire providers in Australia. Our years of experience provides the guarantee that you can count on us to be there when we say we will, and have your staging in place quickly and as you want it. Because the stage is the centre of any event, it plays a great part in the success of your function. 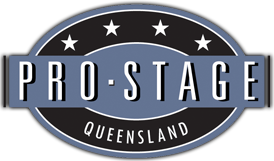 With Pro-Stage Queensland you are assured of stages and flooring for hire that are nothing less than outstanding. The quality of our products is second to none. They are designed to withstand time and weather, and are manufactured using first-rate materials. We give our all in ensuring that you get the results you want. Travelling interstate? Pro-Stage staging is available almost everywhere within Australia. We can organise your interstate requirements for you, or you can speak directly to the local company or agent. Please visit Pro-Stage International for more information of a hire outlet nearest your event.